Georgie isn’t a stranger to the winner’s circle. Alpaca Tracks Georgie has won: Colour Champion at the AO show, Navan Alpaca Show and Expo Cite Quebec. In 2011, he won colour champion at the Eastern Futurity. 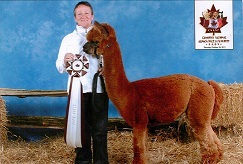 This handsome alpaca has two full siblings that have also won multiple ribbons for colour champions. Georgie is a very correct male in all aspects of conformation. His fleece is a rich light brown with excellent fibre qualities. He has a very low amount of primaries and small amount of variation in micron throughout his fleece, giving his fleece an exquisitely soft handle. Crimp, lustre, bundling and density are all part of the package. Georgie is very gentle in nature and easy to handle. His bloodlines include Victor’s Vaccoyo and Peruvian Enrique. We are looking forward to Georgie’s first offspring in 2013. It is with great pride that we offer Alpaca Tracks Georgie as an option in your 2013 breeding choices.